The Jackie cardigan is a J. Crew classic. It's the perfect go to light cardigan, and it comes in dozens of colors and styles. I love this navy embroidered version. Navy and white are an obviously great color combination, and the embroidered eyelet makes this simple cardigan a bit more fun, summery, and feminine. If you work in an office, this is the perfect cardigan to throw on when the A/C is blasting. As I was scrolling Tuckernuck's website, my eyes immediately landed on this gown. It's such a rich and luxurious shade of navy, and the tiered ruffles add a beautiful detail to an otherwise simple dress. 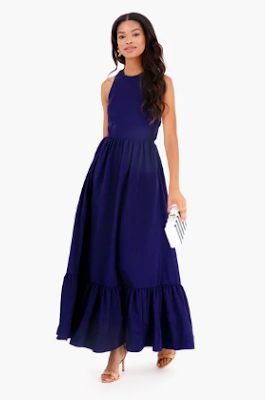 I personally have nowhere to wear this dress, but if you have a black tie wedding to go to in the summer or early fall this would be a great option. It could be dressed up with a gorgeous statement necklace or a fun clutch. It's such a versatile and beautiful dress. As always, I'm a sucker for anything with a bow, and the shoulder bow on this top drew me in. This top is a little bit longer in the back than in the front, so it would look better with pants or capris than with shorts. 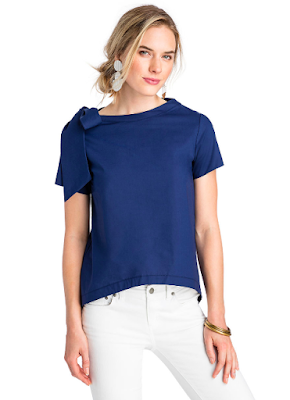 I actually love how Vineyard Vines styled the model in this top. It looks so elegant with white pants and white statement earrings, and keeping the outfit relatively simple ensures that the eye is immediately drawn to the shoulder bow. This tank is a great day to night top for summer. 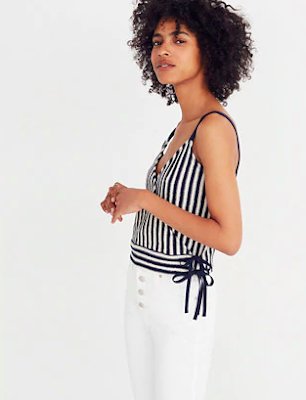 It's navy and white stripes, but they navy is so dark that it makes for a great evening top too. I love how the strip of horizontal stripes at the bottom juxtaposes with the vertical stripes, and the side bow is a darling detail. This top would be great with a variety of fun, brightly colored solid shorts, or even a mini skirt. 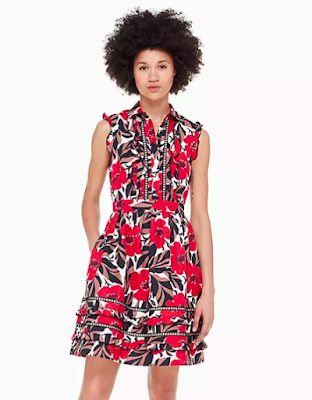 I generally don't wear a lot of red, but this Kate Spade shirtdess is gorgeous. I love the shape of the poppies in the print, they're edgy but classic, and the dress itself has beautiful details. The tiered stripes across the bottom adds some lovely structure to the dress, and the slight ruffle at the edge of the sleeve adds a fun and feminine touch.